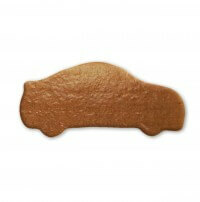 The sleek Coupé gingerbread can be labeled and designed by you. Small and big motor sports fans will have a lot of fun with this blank. With your creativity this gingerbread becomes something very special. You can find everything you need to decorate it in our shop. So your car becomes a real masterpiece!